This post is just for the icing recipe I used on my cookie. It's simple to make, dries out nicely and so easy to pipe! 1. Stir sugar and milk together in a bowl until icing mixture is smooth. You might get lumps, but try to press in the sugar into the lumps. 2. Beat in corn syrup and flavouring until icing mixture is smooth and glossy in appearance. I used a egg-whisk because the amount was small. 3. Add food coloring to desired shade. 4. Put icing in a plastic bag and cut out a tiny hole at one corner of it. Use it to squeeze the icing out like a pen. 5. Ice cookie and set aside for the icing to harden. This would take more than an hour, depending on the humidity etc. To be sure that the icing hardens in time, try to ice the cookies half a day to a day before needed. If you double or triple the amount of icing made, you could make the initial amount using a mixer. Then add colouring after the icing is made. If you want to use the icing to coat the cookie, then thin the icing using more milk. Add the milk in by half teaspoon increments until you get the consistency you need. You can use a clean paint brush to help you decorate your cookie. 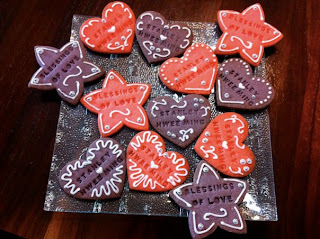 Another method is to pipe the "outline" of the cookie and then pour in the thinner icing into the shape left by the outline. Whatever you do, enjoy the creative process and have fun decorating your cookies! These are cookies made from a special cookie cutter that impresses letters while cutting out the cookie shapes. Below are cookies that I iced with the icing I made. I didn't add in any colours because the base colour of the cookies were so vibrant. After icing these 10 big cookies, I still had half of my icing recipe left. The silver ball sugar bits are available from Phoon Huat, and they make a lovely accent to the cookies.